I already have an xbox lol ???? I've got a 2017 orbea loki h30+. It is brand new as I bought it in August 2018 but I always gravitate to ride my trance instead. It literally has 22kms on it so maybe someone else could enjoy it more than me. That being said I'm in no rush to sell and will let it go for the right offer. 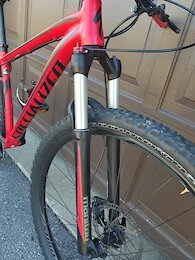 I bought it for MSRP + tax which came to $2034 so for someone who wants a sweet trail geo hardtail for a reasonable price. The bike is 100% stock except for the deity knuckleduster grips, no pedal are included but can throw in some basic flats. Hubs are boost 110 and 148. 11 speed Slx with an 11-46t wide range cassette. Sun ringle düroc 40 rims laced to orbea branded shimano hubs. Rockshox recon rl. Just look it up for the full specs. Thanks for reading. Happy trails! NO TRADES FOR ANY KIND OF ROAD BIKE!! !